Do I Have Actinic Keratosis? Actinic keratosis is a skin disorder that has a direct relationship with sun exposure. The dermatologists at Georgia Dermatology Center are extremely familiar with this disorder and will carefully examine your skin to determine the specific treatment required. The sun produces actinic keratosis which are considered precancerous lesions that increase with age and accumulation of skin damage attributed to exposure to UV and other harmful rays emitted by the sun. Light complexioned individuals are more susceptible to developing actinic keratosis than darker complexioned individuals. Repetitive episodes of sunburned skin also contribute to the potential for developing the lesions. Actinic keratosis initially changes the texture of the skin, exhibited by scaly, rough patches. A yellow, white, or red crust eventually forms on affected parts, which usually bleeds when the crust is scraped or scratched. Symptoms and extent of affected sites vary from person to person, depending on history of sun exposure, age and skin type. Although initially the patches are usually relatively undetectable in color from the adjacent skin, as the condition progresses the colors may range from hues of red to brown to hues of pink to gray. Most commonly, the spots appear on those areas of the body that r eceive the greatest overexposure to the sun, particularly on the scalp of people who are bald, and on the ears, nose, lips, back of the hands, arms, and shoulders. Affected patches may range in size from pin-sized to dime-sized spots, and in severe cases may begin to merge together. In some circumstances, if exposure to the sun is minimized, the condition may enter a remission phase. However, sun damage does not actually reverse, and the lesions may re-occur at the same locations at a future date. If left untested and untreated, Actinic Keratoses may eventually progress to skin cancer (squamous cell carcinoma). It is important to completely follow the instructions given you by Dr. Alexander Gross for treatment to be as successful as possible. Patients with multiple areas of actinic keratosis are at higher risk, and should any of the lesions become swollen, painful, and leak fluid, malignancy may be indicated. In such cases, to ascertain if the growth is harmless, we recommend surgical removal for biopsy. Depending on the size and location of the keratosis, the healing time typically takes up to three weeks, although hands and legs tend to heal more slowly than the face. It is important to see Dr. Gross if you believe you have symptoms of actinic keratosis, as this skin condition may lead to the development of skin cancer if not treated. Treatment of actinic keratosis requires removal of the defective skin cells. New skin then forms from the deeper skin cells, which have escaped sun damage. Follow up treatment may consist of acid peels to reduce overall topical sun damage in conjunction with pro-active daily application of sunscreen. 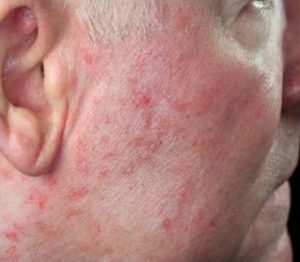 When the keratoses are widespread, removal of all of the spots is not possible, and cancerous cells detected, application of 5-fluorouracil (5-FU) or a similar cream is prescribed. These anti-cancer medicines work by slowing or stopping cell growth, interfering with the ability of abnormal cells to grow on the skin’s top layer. The areas of diseased skin become inflamed and crust over as the abnormal cells die, allowing healthy cells to emerge from underneath. Dr. Alexander has been treating patients at Georgia Dermatology Center for over 20 years. His experience is highly regarded from patients he has treated all over the Atlanta metro area including Alpharetta, Milton, Sandy Springs,Johns Creek, Buford, Suwanee, and Roswell. Your skin’s overall health is important to us. Please call 770-781-5077 to schedule a comprehensive skin check at Georgia Dermatology Center.